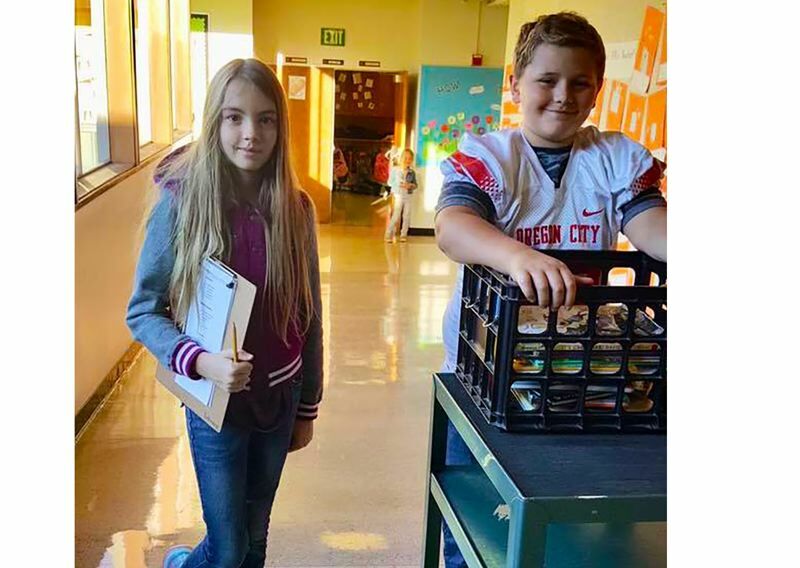 Fifth-grade students at Gaffney Lane Elementary in Oregon City take on many extra responsibilities to help their school run smoothly. Jobs include safety patrol, equipment pick-up and helping in the school library. To participate, kids must apply for a school job, get references from past teachers, and get hired by a staff member. They are expected to perform appropriately and are paid with special "fifth-grade money" that allows them to purchase healthy snacks, headphones and school supplies. At the end of the school year there is an auction where students can spend their money on donated items. "This has become a fun tradition here," said fifth-grade teacher Shannon Fernaeus. "This has been a real-world experience to help kids understand how the world of work functions while they learn to take on responsibility." Start Making A Reader Today (SMART) is a nationally recognized reading program that pairs children in kindergarten through third grade with adult mentors who share the joy of reading one-on-one for an hour each week. Gladstone's Center for Children & Families and John Wetten Elementary are served by the program. In Oregon City, the program serves Candy Lane, Holcomb and Jennings Lodge elementary schools. In North Clackamas, the program is at Sunnyside, Oak Grove, El Puente and Ardenwald elementary schools. The program also serves local Head Start preschools. "SMART provides a fun, child-guided experience that builds reading skills, self-confidence and a love of reading," said program coordinator Nathan Buck. "Children in the program receive 14 new books throughout the school year to keep and read with their families." Volunteers are needed one hour per week through mid-May 2019. Schedules vary by site. To volunteer as a reader or site coordinator, call Nathan Buck at 971-634-1607 or apply online at getsmartoregon.org/our-community/volunteers. North Clackamas Superintendent Matt Utterback says fiscal challenges facing NCSD have caused the district to undertake furlough days among its steps to control costs. For the 2018-19 school year, NCSD's mandatory furlough days are Nov. 19-21. On these days the district is closed, and the schools, administrative office and CARE after-school programs will not be available. Each day of closure saves NCSD approximately $500,000 in operating costs. "These furlough days would not be necessary if the state provided sufficient funding, but in its absence, NCSD has to make difficult decisions that I know are painful for everyone," Utterback said. "I sincerely wish NCSD didn't have to implement furlough days, but the closures reflect NCSD's financial reality." The new Sunrise program serving students at Jennings Lodge and Candy Lane elementary schools provides families with greater drop-off flexibility, while ensuring students a smooth start to the school day. Free to families, the program is funded by Federal Title 1 funds. The program gives students the opportunity to drop children off at Jennings Lodge as early as 7:15 a.m. giving students supervision and time to eat breakfast, read, color or play board games before the school day begins. Candy Lane students are bused to their school just before school begins. "This program provides a safe alternative for students whose parents need to head to work before the traditional school day begins," said Principal April Albers. "Students begin their day with positive interactions with friends and staff, strengthening their connection to the school community." The Rex Putnam High School Drum Line is celebrating its 10th year with an online auction fundraiser throughout November. Auction donations are needed through October, and the auction goes live Nov. 1. The program also is running a Willamette Valley pie fundraiser and business sponsorships. "We're now competing in Scholastic A and climbing the ladder," said drum-line director René Ormae-Jarmer. "I have staff now, and we've increased our numbers. However, we still have to fundraise and grant-write to make this popular program go." For more information, visit kingsmenthunderdrumline.com. All proceeds go toward uniforms, equipment and competition expenses. The drum line is the only competing one in the area. (Portland schools only have one at Lincoln High School). Fifth-grade teacher Kala Ott was recognized on K103 radio's Honor Roll for her commitment to student learning and her creative efforts to build a positive and supportive classroom culture. Ott began teaching this year at Gladstone's John Wetten Elementary School. Prior to coming to Gladstone, she had taught since 2012 in Texas. "My son has blossomed under her tutelage, going from someone who dreaded reading to a kiddo who devours book after book," said parent Andrea Alba, who nominated Ott for the honor. "When you step into her classroom, you are instantly transported into the wonderful world of Harry Potter." As an honoree, Ott received a number of prizes, including a $500 gift card for school supplies, a Concordia University continuing education scholarship valued at $2,800, a $2,500 technology grant for Chromebook computers and catered lunch for the teacher's lounge from Jersey Mike's.